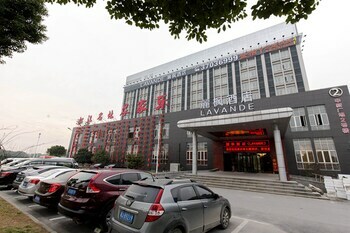 With a stay at Lavande Hotel Shanghai Hongqiao NECC in Shanghai (Songjiang), you'll be 8 mi (12.8 km) from Happy Valley Amusement Park and 9 mi (14.5 km) from Shanghai Film Park. Free self parking is available onsite. With a stay at Gushen Boutique Hotel in Kunming (Guandu), you'll be 5.1 mi (8.2 km) from Willows Beach and 9.8 mi (15.7 km) from Tuodong Stadium. Free self parking is available onsite. With a stay at Xiamen Xiangshang Yiting Hotel in Xiamen (Siming), you'll be within a 15-minute drive of Cultural Art Center and Xiamen Mingfa Commercial Plaza. Free self parking is available onsite. With a stay at Happiness Apartment in Xiamen (Jimei), you'll be 12.9 mi (20.8 km) from Cultural Art Center and 6.4 mi (10.3 km) from Jiageng Park. Free self parking is available onsite. With a stay at Suzhou Canal Garden Hotel in Suzhou (Gao Xin District), you'll be within a 15-minute drive of Hanshan Temple and Lingering Garden. Free self parking is available onsite. Located in Hohhot, Tianhe International Hotel is within a 15-minute drive of Inner Mongolia University and Inner Mongolia Museum. A shuttle from the airport to the hotel is provided at no charge.